Have we met Einstein’s challenge and changed our mode of thinking? In part, we have. The international community has increasingly recognised that the disproportionate effects and existential costs of weapons of mass destruction warrant comprehensive bans. But we have not rid the world of nuclear weapons, and progress to that end has stalled. The International Court of Justice is clear in its view that there is no circumstance in which the use of a nuclear weapon would be consistent with international humanitarian law. As President Ronald Reagan and President Mikhail Gorbachev agreed, ‘nuclear war can never be won and must never be fought’. Fifty years ago the Nuclear Non-Proliferation Treaty (NPT) opened for signature after negotiations lasting three years. It remains the bedrock of international efforts to limit the possession of nuclear weapons. It is founded on a central bargain. In return for the non-nuclear-weapon states forgoing the development, possession and use of nuclear weapons, the five nuclear-weapon states agreed to negotiate the dismantlement of their nuclear arsenals and their eventual elimination. To an extent, the bargain has worked. Some 20 states that had been contemplating a nuclear weapons capability renounced their ambitions and signed up to the treaty. But Israel, India and Pakistan never signed the NPT and North Korea exited the treaty, choosing instead to pursue a nuclear weapons capability. The success of the NPT depends on its supporting safeguards system, managed by the International Atomic Energy Agency. Monitoring and verification continues to be a central element of the NPT and its additional protocol. Safeguards and verification are essential for non-proliferation and disarmament. In an environment where states are inherently distrustful of one another, safeguards and verification build trust. But progress has stalled, and there is a growing disaffection and frustration among many of the non-nuclear-weapon states. The number of states possessing nuclear weapons has increased to nine. And NPT nuclear-weapon states have modernised their nuclear arsenals, increasing their efficiency, effect, lethality and accuracy. In short, the nuclear-weapon states have not made sufficient progress on their commitment to disarm. They’re risking the central bargain. Understandably, non-nuclear-weapon states and civil society have sought a new pathway to achieve a nuclear-free world. Supported strongly by the International Committee of the Red Cross and ICAN, a resolution of the UN General Assembly’s first committee established a special UN conference to ‘negotiate a legally binding instrument to prohibit nuclear weapons’. The negotiations were boycotted by the five nuclear-weapon states, along with the other nuclear-armed states and many allies, including Australia. The negotiations produced a draft Treaty on the Prohibition of Nuclear Weapons, which was adopted by 122 states on 7 July 2017. To date, 69 states have signed the treaty, 19 of which have ratified it. The Nuclear Weapon Ban Treaty recognises that the current system hasn’t reflected the aspirations and demands from the global community for a nuclear-weapon-free world. But the treaty, which has had a major normative impact, has significant shortcomings with respect to universality, safeguards and verification, and security. An incomplete consensus against the possession and use of nuclear weapons is not enough to achieve a nuclear-free world. It has to be universal. The treaty’s safeguard arrangements are also inadequate. It offers signatories an alternative, less onerous, safeguards standard that does not extend to the IAEA’s additional protocol directed to undeclared sites or facilities. Its failure to adopt the strongest safeguards and verification regime undermines its effectiveness and has the unintended effect of undermining the effectiveness of the NPT’s safeguards system. For nuclear-weapon states and their allies, the Ban Treaty has profound consequences for defence and security arrangements. The ANZUS treaty is the cornerstone of Australia’s defence and security arrangements. We are a close ally of the US, and we benefit from its strategic power. As my colleague Richard Marles has pointed out , ratifying the Ban Treaty risks impacting on Australia’s alliance with the United States. There is a dilemma at the heart of the contemporary disarmament challenge: how do we collectively build the path to disarmament in a context where mutuality and security are a precondition of success? While our ultimate objective must be a universal ban, we must recognise the context in which we operate. In an environment lacking trust, the unequal treatment of states with regard to safeguards and verification arrangements will thwart progress to a world free of nuclear weapons. The question is, how do we make progress and what role can Australia play? Labor’s foreign policy is founded on the principle that we deal with the world as it is and seek to change it for the better. Australia is an independent multicultural nation, confident of our place in the world. We reflect this in the assertion of our interests and our advocacy for our values. Labor believes that Australia can and must play a constructive role to re-engage our allies and partners to achieve minimisation and then, ultimately, elimination of nuclear weapons. First, we need to muster wide international support, including from the states that possess nuclear weapons, for a ‘no first use’ declaration. While we do not underestimate the complexity of this task, given the increasingly blurred boundaries between conventional and nuclear forces in armed conflict, such a collective declaration would be a significant confidence-building measure. Second, we need to leverage Australia’s strong relationships with nuclear-weapon states to advocate for progress in negotiations on Article VI of the NPT and to press for an internationally agreed weapons minimisation program involving all states possessing nuclear weapons, with a view to identifying a nuclear weapons elimination target date. We also need to re-energise international action to conclude a ‘cut-off’ treaty to ban the production of fissile material. Third, we need to strengthen existing institutions and agreements, especially by building the capacity of the IAEA to meet the challenges in the next phases of the nuclear disarmament agenda. And we need to maintain sanctions and strict enforcement measures against states seeking to proliferate nuclear weapons outside of the NPT—as we have done in the case of North Korea. When Einstein drafted his telegram, he had no doubt thought deeply about the unimaginable pain and suffering experienced by the unsuspecting citizens of Nagasaki and Hiroshima as they went about their daily business in the dying days of World War II. World leaders have a solemn duty to prevent such a catastrophe from reoccurring. 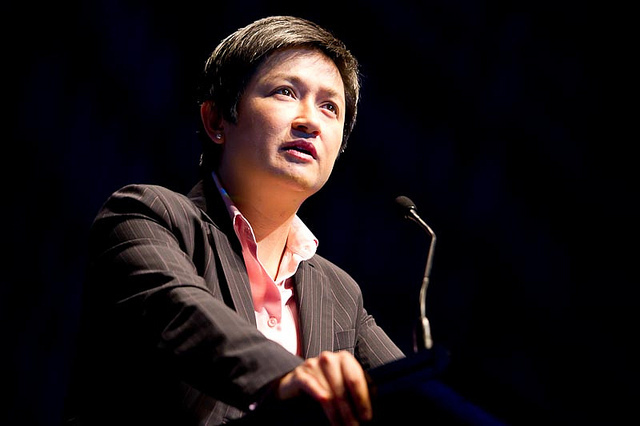 Senator Penny Wong is the shadow minister for foreign affairs. This is an edited version of a speech she delivered to the national conference of the Australian Institute of International Affairs on 15 October 2018. Image courtesy of NCCARF on Flickr.